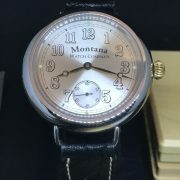 Stunning Montana Watch Company 2nd Generation Highline Aviator Stainless Steel Case with Solid Gold crown. 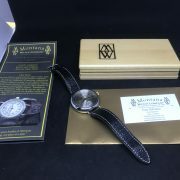 This watch features a Swiss manual wind movement and very nice 48mm Case. 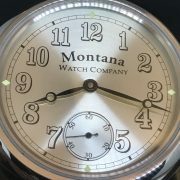 Montana Watch Company founder Jeffrey Nashan began his career in the field of vintage timepiece restoration. 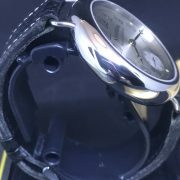 Jeffrey was intrigued by the combination of engineering, craftsmanship, and artistry utilized in horology and soon began to focus on the works of early American watch manufactures. 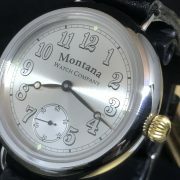 Inspired by these pioneers and wanting to carry on their tradition, he created the Montana Watch Company. 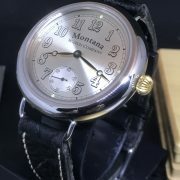 His first wristwatch was the Model 1915, a wire-lugged timepiece paying homage to the transition of timepieces from the waistcoat to the wrist, which happened around the turn of the 20th century. The 100 piece limited edition of the Model 1915 was so well received that it quickly sold out, inspiring Jeffrey to create an entire line of watches which today consists of nine different models. 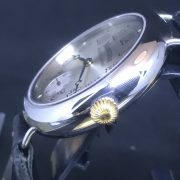 Horology is the science of time, timekeeping, and timekeepers. 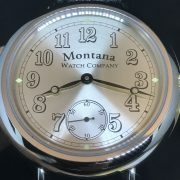 At the Montana Watch Company, horology is an art and a commitment to making the best timekeepers available. 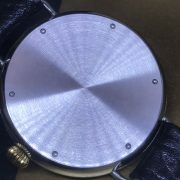 As the sole watchmaker for the company, Jeffrey Nashan starts with the finest Swiss mechanical movements available, rebuilding, regulating and adjusting them to the highest standards of performance. 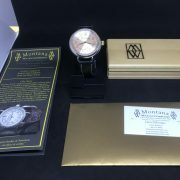 Jeffrey combines time-honored practices with the latest technology and equipment to ensure that our mechanical movements are regulated to the highest specifications. 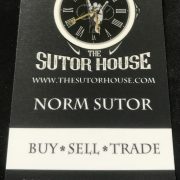 All of our movements are warranted to rate plus or minus 6 seconds per day and to maintain a 30 to 40 hour power reserve at full wind. 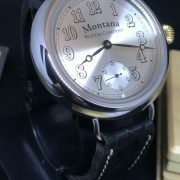 STRAP/BRACELET: – Original Montana Watch Company Leather strap with steel tang buckle.